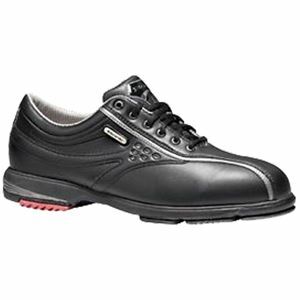 This shoe can be used by a Right OR Left Handed bowler. The soles and heels on BOTH feet are removable and interchangeable. H2 sharktooth heel; H5 Dual density heel; H7 Microfiber heel; to control the way you bowl. Interchangeable soles using VELCRO technology including PS2, PS4 and PS8 slide sole to provide the perfect slide on any approach. Flex Zone technology with Perfect Slide soles for a longer, controlled slide that flexes with the natural motion of your foot. MicroTech upper: special microfiber upper material. Reduces weight while providing a lasting, durable fit. Outlast lining: temperature-regulating lining technology. NASA engineered lining to reduce heat and moisture by nearly half. Tour Master converts for a right handed player or a left handed player. PowerFlex: The key to great shots is in creating perfect leverage. The new Tour Master with Power-Flex Technology delivers “graduated Braking”, a new dimension in slide and brake control that lets you create perfect leverage and power on every shot" regardless of approach conditions. In the same way that disk brakes bring a car to a smooth and gradual stop, Tri-Pod slide pads and the lockPod heel brake work in harmony to deliver maximum control between the slide and brake phases of delivery. Utilizing Power-Flex Technology, bowlers can instantly tune their shoe to provide the optimum level of graduated braking on any approach condition!